Apparently, 375 million years ago, fish could walk. According to the San Francisco Chronicle, scientists found a fossil of a creature that had the scales, gills and fins of a fish, but also had ribs and the primitive limbs of land creatures. One of the paleontologists, Neil Shubin, said: “What we found was clearly a fish, but it had a long flat head with its eyes on top like a crocodile, a shoulder, an elbow and a wrist.” This fish spent most of its time swimming, but also climbed out of the water and hunted on land. 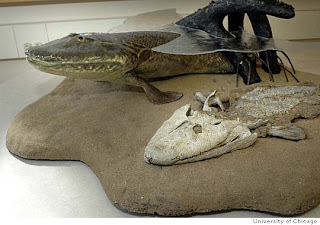 Picture: Fossilized remains of Tiktaalik rosae, the fish that could walk, and a model of the fish. From the San Francisco Chronicle and the University of Chicago. The discovery of the fish that could walk is being hailed as an important evolutionary link between fish and land creatures. The walking fish was an early ancestor of reptiles, dinosaurs and mammals, including human beings. Science can now prove that we all descended from fish. Perhaps that is why I enjoy spending so much time fly fishing; the trout are my very very distant cousins. One scientist, Jenny Clark of Cambridge University, offered an interesting response to this great discovery: “This is another gap closed that a deity no longer needs to fill.” Clark describes the conflict that can exist between religion and science, between those who believe in evolution and those who read the Bible as the literal word of God. For some people, God played no role in the development of life on earth. Over millions of years, the laws of nature and evolution led single-celled organisms to develop into fish, land creatures and eventually human beings. In this view, nature does not require any divine intervention, and God need not fill any gaps in our understanding of the origins of life. On the opposite side of the spectrum, creationists believe that God created the entire universe exactly as described in the Bible. Genesis chapter one describes how God made everything in the world by the power of speech: “God said: ‘Let there be light,’ and there was light.” In Genesis, there is no mention of any ideas that suggest evolution. There are no walking fish in the Bible either, although there are sea monsters. On day five, God created the fish and the taninim, the great sea monsters, which were perhaps whales. The fish that could walk is not the only fish that symbolizes the conflict between evolution and religion. Some people put an ichthys, or “Jesus fish” on the bumper of their cars as a sign of their belief in Christianity. In response, others have chosen to modify the “car fish” to represent their support of evolution. Some versions add the word “evolution” or “Darwin” within the symbol. There are even "Darwin fish" with feet, which we now know is scientifically accurate thanks to the fish that could walk. I respect the “Jesus fish” symbol and do not agree with making fun of the beliefs of others. However, the many versions of the “car fish” illustrate the continued debate between science and religion. Pictures: "Jesus fish" and the "Darwin" fish with feet. Courtsey of wikipedia.org. How does one navigate the conflict between evolution and creationism? I believe in evolution and that humans came about by the rules of natural selection and survival of the fittest. I also believe that the Bible has lessons to teach us about our origins. Both perspectives, the scientific and the religious, have value; they simply address different questions. Science answers the “how” and “where” questions quite well: Where did humans come from? We evolved from earlier life forms. How are we related to other animals? We all come from the same source, the single celled organisms of millions of years ago. However, science falls short in responding to the “why questions”: Why are we here? Why are we conscience beings, with the self-awareness that separates us from animals? Genesis provides us with religious answers. The Bible says that there is a God who cares about this world and created it as an act of kindness and love. After six days of creation, God surveyed the world and found it to be very good. Despite all of the evil and struggle that we must all face, our world is an inherently good place, where we can find blessing and hope. In light of evolution and science, perhaps we cannot read the Bible literally. The world was not created in only six days, and God did not make all creatures from nothing, rather they evolved. However, there are ways of reconciling evolution and Genesis. God can still play a role in the creation of the world. Science tells us that nature follows rules, like gravity, so that a ball will always fall back to the earth when you drop it. But where did gravity come from? How is it that nature is so perfectly designed that our earth can exist, and that we could evolve from a walking fish? How were the rules created in the first place that allowed our world to function? One metaphor for the origins of the universe compares God to a clock-maker. God would up the clock, and then let it go. Since then, our universe, like a clock, has run on its own, according to the laws of nature. Perhaps God’s role was in creating the rules and the system in the first place, whereby an amazing earth and human beings could evolve and question their own origins. Jenny Clark was right when she said that the discovery of a walking fish was another gap closed that a diety no longer needs to fill. However, there will always be some questions that science cannot answer, some mysteries that cannot be solved. Evolution will probably draw a straight line from the formation of the earth 4.5 billion years ago to us humans. However, evolution will not be able to explain why the world is so perfectly designed or why we feel such awe in the beauty of nature. The next time I go fly fishing, I may remember that the trout and I have a common ancestor, a walking fish. But as I stand in the stream, and cast my line surrounded by the peace of nature, I will probably be more apt to recall what God said about our world: it was very good. 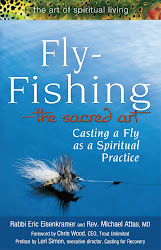 I had not heard about the "fish with feet" before reading about this on your blog, from which I always learn a lot about something to do with life as well as enjoy your fly fishing exploits. As one who believes in modern scientific materialism I respect everyone's right to believe as they want. I especially appreciate the manner in which you have the courage to present scientific findings alongside your personal beliefs. If people would learn to appreciate the differences among the the human race as you do we would probably have a much better world to live in.